I had dinner with a few college friends to celebrate a birthday! It just so happened that the girls arrived at the restaurant on time, while the boys were late because they went to the wrong location…! Falafel Bite is located in Sunnyvale and Milpitas. Also, this chain is called Falafel Bite, not Falafel Stop. Falafel Bite is a Mediterranean restaurant, with a few Middle Eastern dishes. I browsed their website prior to coming, and noticed a lamb dish (I love lamb!) with a name I’d never seen before- mansaf. 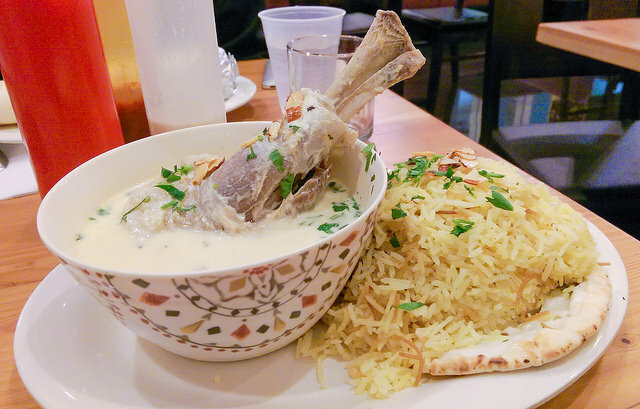 Falafel Bite’s mansaf consisted of lamb shank cooked in aged yogurt, served with rice, lavash bread, and topped with freshly roasted almonds. This is perhaps, the modern way of presenting mansaf; the lamb and yogurt sauce is traditionally spread on top of the rice, which is on top of a flatbread. Mansaf is the heart of the Jordanian cuisine. It is basically a stew of meat in fermented goat’s milk, that is very uniquely delicious. The Mansaf that we know today is inspired and based on the Saudi Arabian dish “Thereed”. Thereed is essentially a dish made out of meat, broth and bread. The whole area was inhabited by Bedouins and as these happen to be living in the desert, they kept on moving in search for water and shelter from the harsh weather conditions in the different seasons. These relocations have carried with them the Bedouin’s food and traditions to the new areas. The early Jordanian Bedouines ate Thereed as their main food, of course as being a desert the food was limited to that environment’s produce. As Jordan started becoming an agricultural country, and being influenced by the peasants and the cultures of the dislocated neighbours, the country’s produce started growing in number and kind. Consequently, the Jordanian Bedouins started introducing new produce into their food, such as rice, wheat, Bulgar as well as yoghurt. Which eventually went into their main food preparation and evolved the originally Thereed into what is now known as Mansaf. The making of Mansaf, starts well before the actual cooking. Making the Jameed (fermented yoghurt, from which Mansaf is made) is the first step. Jameed balls, are bought from local stores, and some speciality stores. In Jordan they are always bought from the source: the Bedouins making it. Nowadays, there is a modern version of Jameed that comes in carton containers, already liquified, but they are no where near the goodness of the original dried Jameed balls. Jameed is made out of milk. The milk can vary from maker to another and sometimes from area to another, and so does the quality. The best quality Jameed is made out of Goat’s Milk. The Karaki Jameed (Coming from Karak) is famous to be the best in Jordan. The Goat’s milk is put in a container to change from milk to yogurt. It is then placed in a sack (originally made from goats’ skin) and shaken to seperate the milk solids from liquids. In the old days, a Bedouin lady would sit and shake the milk till ready, but nowadays there are machines that carry out this step. The butter (milk solid) will then be taken and made into local ghee (Samen Baladi), which is later on used in the cooking of Mansaf. The remaining Soured Milk (liquids) is then heated to separate further. The whole separated mixture is then placed in a large cloth (kind of like a cheese cloth technique) to completely drain out all the remaining liquid. There will only remain Jabjab, which is the hard solid part. This is then mixed with salt, and left for a further 24 hours in the cloth to dry. Then it is taken out of the Cloth, and pressed together and shaped into balls, which are then left to sun-dry for 2-3 days. These Jameed balls will then be rock hard, and the name literally meaning solid is reflective of their dry solid state. These Jameed Balls can be stored for about a year, which is very convenient for desert life, as they had no access to refrigeration and other storage options. Then when ready to cook, the Jameed is rehydrated, by being broken up, soaked in water and rubed to go back into liquid state. It is then added to meat and broth, creating a yoghurt-based sauce. Drawn mainly from Bedouin Traditions, Mansaf is usually offered by Jordanian hosts as a token of appretiation, respect and value. It is an expression of how valued you are to them as their guest. The meat used is generally indicative of the guest’s status to them. If it is made with Goat’s Meat that is reflective of the highest grades of respect and value, less is the lamb, and least is the chicken. The original Mansaf will have the cooked head of the goat, placed at its centre. This is usually offered to the most important or valued guest by the host as a symbol of respect and great hospitality. Traditionally, ready-to-eat Mansaf is placed in a large serving tray (Sider) as it is tradition for all to be served from one dish. Mansaf is traditionally eaten with the fingertips of the right hand, while the left hand is placed behind the back. The host will keep on drenching the rice with cooked Jameed (yoghurt sauce) for his guests to enjoy a moistened bite. by doing so, the host is also ensuring best hospitality and celebrating the obviously valued guests. Those are the traditions, which many still carry out today. But the symbolism of Mansaf still remains that of respect, utmost hospitality and appreciation for guests. It is therefore served when you are being celebrated and welcomed into a Jordanian Home, and always advisable that you express understanding that they have gone above and beyond to make you feel welcomed and appreciated. Mansaf is perhaps taken even more seriously in Jordan. Palestinians make up a large portion of the population of Jordan today, but native Jordanians are, for the most part, Bedouin. Among Jordanians, great debates can ensue about the preparation of mansaf. One Iraqi woman told me that her relationship with a Jordanian man broke up because she admitted to not caring for mansaf. My former brother-in-law, Omar, a Palestinian connoisseur of a great feast, told me that one of the root meanings of the word mansaf is “explosion,” and it is truly that: the tastes and aromas are an explosion of flavors. The flavors come not so much from spices but from a curious little dried yogurt product called jamīd. Jamīd is defatted and dehydrated yogurt made from sheep or goat’s milk and sold in rock hard nuggets prepared in the spring and summer. It may have been originally a nomadic Turkish invention. The butterfat of the yogurt is separated by churning, accomplished by shaking the yogurt in a goat skin bag called a shakwa. The separated butterfat is then used to make samna, clarified butter. The defatted yogurt, called makhīd at this point, is strained under high pressure through a cloth, concentrating it into jamīd. The jamīd is salted and formed by hand into small balls to be placed in the sun and dried until hard. To reconstitute the jamīd, which is now fifty percent protein, it is soaked in water and then melted, giving its distinctive earthy flavor to the mansaf. How one eats mansaf is as important as how it tastes. Several overlapping sheets of a thin fine wheat flour flatbread, the size of a small pizza, called marqūq, are laid directly on the table or a large communal platter and are covered with the meat and rice. Another bread can be use, called shrak, a whole-wheat flatbread baked on a domed griddle over an open fire. It is very thin, as is marqūq bread. Everyone eats with his hands in a ritualized manner with a high degree of etiquette. Hands are first thoroughly washed and the right sleeve rolled up. Guests sit or stand around the table sideways, with their right side tilted slightly toward the food and eat only with the first three fingers and thumb of the right hand. Each person stakes out a small area of the mansaf that is in front of him and moistens it with the bowl of jamīd that is passed around. Grace is given and the eating begins. One eats in one of two ways. Small amounts of rice and meat are picked up, compacted slightly, and brought up to the mouth. No food should fall from the hand or the mouth as you eat, nor should your fingers touch your mouth; the food is flipped into the mouth from about an inch away. In another method diners form a ball of rice in the palms of their hands, constantly flipping the ball in the air because it is quite hot. Then, for those who are and talented, the rice ball is flipped, sometimes from a foot away, into the mouth. In some situations the host will form the rice ball in his own hand for the guest of honor.